Our social, moral, spiritual and cultural education (SMSC) alongside our student voice is outstanding and has been held up nationally as a model of good practice. We also offer an extensive program for enterprise education and careers education guidance. For further details please follow the link to the relevant pages. We have an extensive range of extracurricular clubs and opportunities for students outside the taught curriculum including five days where we collapse our timetable to enable students to participate in exciting enrichment opportunities both in school, trips into London and abroad. Further details of our extracurricular program can be found by following the link to our extra-curricular page. Literacy and numeracy are embedded within all subject across the curriculum. We also have a number of literacy programs such as “Lexia” and “Right to Write” which support students in developing these essential skills. Further details can be found on our literacy and numeracy pages. 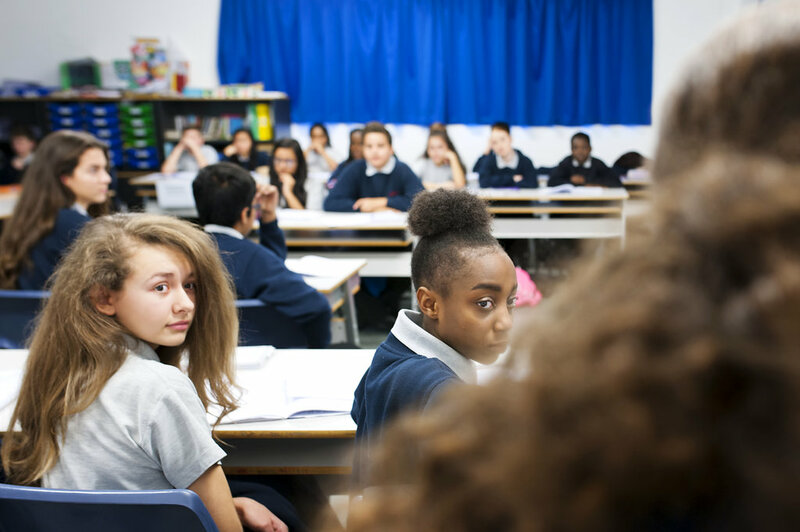 Our KS3 curriculum helps prepare students for the demands of KS4. Details of the lessons taught and the amount of hours allocated to each subject can be found in the table below. Please the individual subject pages for detailed content on the topics taught in each year. Support for students who enter below age related expectations is through our whole school literacy program, and through specialist teaching in the English and maths department as part of our Nurture curriculum. Some students receive additional support through our Student development department (SDD). Further details of the programs they run can be found on the SDD department page. Option support is offered to a small number of students in our SDD department who may struggle with four options and require study support during the week. For a small number of students an academic pathway in school is not suitable. We have a number of students who attend college in KS4 and follow an alternative curriculum. We work closely with the local authority and outside providers such as Barking college to provide a variety of vocational pathways for these students. At KS5 we work alongside three other schools in the local area to form the southern consortium. This enables us to offer a wide variety of courses for our students. Details of the options available can be found on the Southern Consortium website or on our sixth form pages. Details of the contents of the courses taught on site at Jo Richardson can be found on individual subject pages.